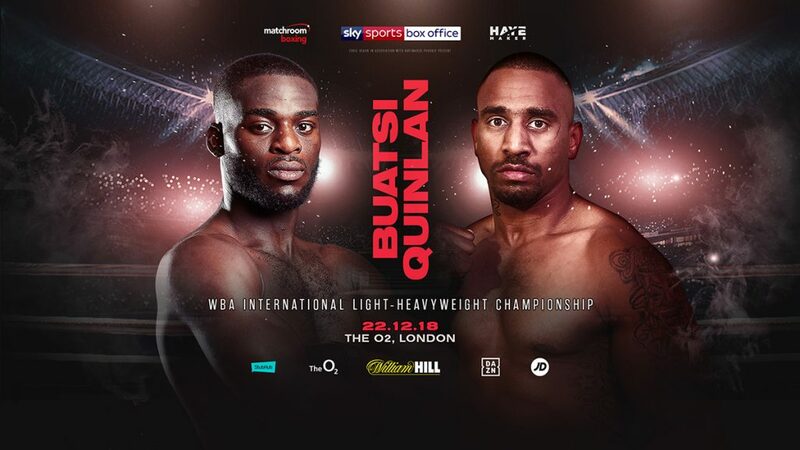 Joshua Buatsi will defend his WBA International Light-Heavyweight title against Australia’s Renold Quinlan at The O2 in London on December 22, live on Sky Sports Box Office in the UK and DAZN in the US. Buatsi won the title in spectacular fashion when he destroyed Andrejs Pokumeiko inside one round at The O2 in July before blitzing Frenchman Tony Averlant in the opening round at the Metro Radio Arena in Newcastle in September. The 25-year-old Croydon star is hoping that former IBO Super-Middleweight Champion Quinlan will take him rounds. December 22 will be Quinlan’s second fight in the UK, he took Chris Eubank Jr. ten rounds when they clashed at the Olympia last year. Buatsi vs. Quinlan is part of a huge night of boxing in the capital. Charlie Edwards gets a second shot at a World title when he challenges Cristofer Rosales for the WBC Flyweight World title, David Price and Tom Little meet in a must-win Heavyweight clash and British Featherweight Champion Ryan Walsh puts his Lonsdale belt on the line against Watford’s Reece Bellotti.